An overwhelming 98% of postal workers in London have voted to withdraw CWU funding from the Labour Party. While this was only a consultative ballot it reflects the alienation and anger most postal workers feel towards the Labour Party. 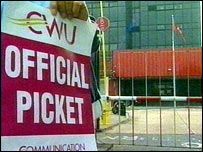 Postal workers in London have been on one day strikes regularly since mid-June against management attempts to slash jobs and casualise the workforce to the extent that no postal worker would have a regular delivery round or duty. New Labour and their goal of privatising Royal Mail are behind all the attacks Royal Mail management have launched on the workforce. They want to destroy it as a public service and sell it off to be asset stripped by the same kind of "investors" that destroyed Rover, making a �40 million profit for themselves into the bargain. But with Royal Mail the profits from asset stripping the entire national infrastructure needed for deliveries (including massive depots in city centres) would dwarf those made by the Phoenix four. The biggest obstacle to privatisation has always been the postal workers' union. This dispute is not about modernisation or combating so-called "Spanish practices", it's about Royal Mail and the government trying to smash the CWU to create a casualised workforce that any private buyer can use and throw away as they please. They want most postal workers to have no regular duties, and to turn up to work just to do whatever management pick for them that day. This means not only smashing the union but destroying the Royal Mail as a public service. In East London Royal Mail are suspending collections before 4pm from most Post Offices and post boxes, and some people haven't had any post for days. This isn't due to the strike action but because management are trying to force workers to deliver up to twice their normal workload! For example pickets from the Docklands delivery office explain: "they're getting rid of 10 delivery walks and giving those duties to people on top of their existing work. In one case they took what took another man six hours to do, and said to another do it all on top of your own duty. Even with help he only left the office at 12:30pm to start deliveries, and that was after management told him to stop sorting mail and take out what he'd done already. So far he's bringing work back every day. On top of that he's got about 1000 residential addresses due to open because of a huge new complex." The reason Peter Mandelson's most recent attempt to privatise Royal Mail failed last July is the fighting spirit that postal workers in London and across the country have shown against these attacks, and the temporary drying up of bids from big business due to the economic crisis. This temporary postponement of privatisation is nothing to do with the money the CWU has given to Labour � over �6 million since 2001! Instead of increasing the CWU's influence, continuing to prop up the Labour Party's finances has made the union look weak and encouraged the government to attack them. Most CWU members are disgusted that their union continues to fund the party which is trying to destroy them. 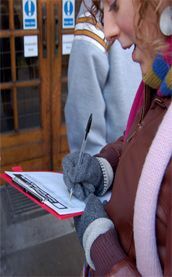 The ballot asked members if they agreed with the CWU London Postal Division that the CWU should stop funding the Labour Party. The result is a resounding blow against those within the CWU, and the wider trade union movement, who argue that the unions should continue to fund New Labour. It will enormously increase the pressure on the CWU national leadership to implement conference policy by holding a national ballot on whether or not to keep the Labour link. The CWU conference in June 2009 voted to ballot members on withdrawing funds from the Labour Party if they continued to privatise Royal Mail. While Mandelson was forced to delay the privatisation temporarily, New Labour is still clearly committed to continue the process as soon as big business bidders available. The government is also backing Royal Mail's current attacks on the workforce as part of the drive for privatisation. CWU members need to put pressure on their union leadership to implement a national ballot on the Labour levy. But the debate cannot be confined to just stopping funding to the Labour Party. The issues now are achieving a �yes� vote in the present ballot for national industrial action, and how to successfully develop that national action. Also the need for the CWU to develop a political voice to add to their industrial muscle and organisation that has kept Royal Mail in public hands over the last 20 years. We need a new workers' party. As many CWU members as possible should attend the conference called by the RMT on 7 November to launch a workers' list of candidates to challenge the main three parties of big business in the general election. The RMT's decision to stand a workers' list (No2EU � yes to democracy) in the Euro elections in June, in a coalition with other trade unionists and socialist groups, which the Campaign for a New Workers� Party supported, was a historic step forward. It's the first time since the founding of the Labour Party that any trade union has stood a national list of candidates against Labour. Standing postal workers and CWU members against New Labour ministers and MPs responsible for attempting to privatise Royal Mail, on a programme of opposing privatisation, job cuts and defending public services would strengthen both the CWU in its fight against Royal Mail management, and the possibility of developing a new party for working people out of this coalition of workers' and trade union candidates. The Tories winning the next election would be a disaster for working people. But even if Labour somehow managed to scrape through, they will be even more savage in their attempts to cut public services than any party for over 100 years. Whichever party wins the next election will try to force through savage cuts to public services including the privatisation of Royal Mail. The most effective way to build opposition to this is to link the industrial struggle CWU members are involved in to establishing a political voice.